The Guardian Teacher Network (GTN) is a site dedicated to helping UK teachers find jobs, focus on a career path and “gain resources and ideas” to assist in their professional development. They even have suggested lesson plans, sample tests and other classroom aids to help teaching professionals with day-to-day challenges. A CiF Watch post (Guardian publishes false information about IDF attack on Ahmed al-Jabari) in November noted that a blog entry at GTN – which provided a summary of the recent Gaza war for educators to use in class – falsely claimed that the Israeli air strike on the Hamas military chief on Nov. 14 also killed a 6 year-old girl and an 11-month old baby. As we noted, the strike killed only al-Jabari and his bodyguard. Following our post, the Guardian corrected the mistake. 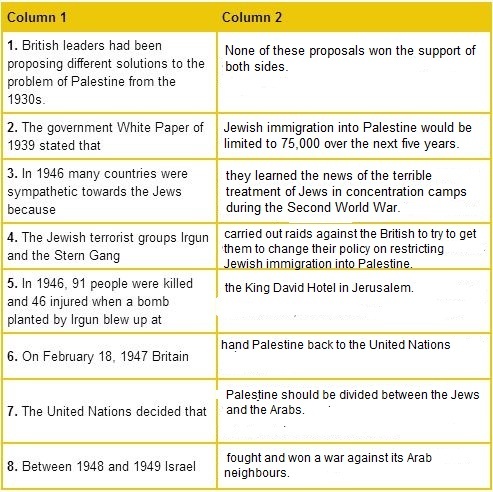 More recently, upon perusing the page to learn what additional information about the Israeli-Palestinian Conflict was available to British educators, I found this history lesson plan for students ages 14-16. After doing this lesson, you should understand why Israel was involved in three wars between 1949 and 1979, why Israel was able to win these three wars, why and with what consequences other countries became involved in conflict in the Middle East, why the problems of the Middle East were not solved by 1979, identify the main motives of each of the countries involved in the disputes in the Middle East, explain why countries outside of the Middle East became involved, and discuss what the consequences were for both the Middle East and the world at large of the failure to solve the Arab/Israeli problem. Here’s the first section, on how Israel was founded. In order to understand why there were wars between Israel and the Arab states in 1956, 1967 and 1973, you need to fully understand what had been happening in the area between 1945 and 1949. Column 1 contains the beginning of some sentences and column 2 gives you [the] endings. Here is the Guardian graphic – which I edited according to the “correct” answers to the questions they provided – representing the sum total of what their education editors deem necessary for students to know about the events between 1945 and 1949 to help them understand the wars between Israel and the Arabs in ’56, ’67, and ’73. The selective history lesson is truly a work of art. Students learn about the White Paper (see #2), but not the Balfour Declaration. (Additionally, there is nothing about the Mandate for Palestine, the the history of Zionism, or 4,000 years of Jewish history in the land). There is an implicit suggestion (see #3) that the justification for Israel’s existence is significantly based on the “terrible treatment of Jews in concentration camps during the Second World War”. Two of the eight questions (see #4 and #5) focus on terrorist acts committed by the Irgun and Stern Gang, yet there is absolutely nothing about Arab pograms, riots, terrorism, and brutality committed against Jews. There is nothing (see #7) indicating which side accepted, and which side rejected, the UN recommended division of Palestine into Jewish and Arab states. Note also that there is no indication that Arabs refused to recognize Israel even after the war, nor the subsequent Arab terror attacks, the Arab League economic boycott and other forms of belligerence – all of which are vital to understanding the subsequent conflict. Moreover, note that Arabs are barely even mentioned in the Q&A table. Arabs – those living in historic Palestine, as well as those in the greater Middle East – are not moral actors in the GTN history of the region between 1945-49. The Guardian Teacher Network recommended history lesson about the Israeli-Palestinian/Israeli-Arab/Israeli-Islamist Conflict is, however, accurate in one respect. It represents an entirely accurate snapshot of the Guardian’s skewed, myopic, Israeli-obsessed and egregiously distorted reporting on the region. Still talking in riddles, snotty? Item 8 is, of course, a complete inversion of what actually happened. Arab armies attacked Israel in order to destroy it at birth, and were defeated. No.1 is also wrong. The Zionist leadership accepted the idea of partition as proposed in the 1937 Peel Commission (Royal Commission of Inquiry to Palestine), although there was a lot of debate and some dissent to this view.. The Arabs totally rejected it, they were never even going to accept a postage stamp sized Jewish state. I don’t know what other proposals were made by the British in the 1930’s. Why should they accept the partitioning of their lands for the benefit of colonising foreigners from Europe? It would be no more rational than the people of Michigan accepting a UN partition in the name of the foreign Islamic colony in Detroit. Remember this conflict didn’t exist till zionist colonisers arrived in total contradiction to the wishes & interests of the longstanding native population. Yes, but for zionism, the Arab/Israeli conflict wouldf never have occured, so the fact is zionism is the root cause for the conflict, Zionist the last gasp of Western Colonialism. Why does all the world accept all the other borders drawn up by the San Remo conference In 1920 and recognize the states created by it? There were many arbitrary lines in the maps drawn then and no one challenges them, the UN leaves them alone. The League of Nations explicitly recognized the historic Jewish connection with the land of Israel. Muslims in Detroit don’t have the same connection with Michigan. There were anti-Jewish pogroms in what is now Israel and in other countries of the Middle-East before the creation of Israel and even before modern Zionism. Truth is the Arabs only ever could recognize Jews as second class citizens under Muslim rule. The idea of Jewish self-determination is anathema to the Muslims and the root cause of the Arab/Israeli conflict. Even if the Jewish community in what is now Israel remained small and never constituted a majority, there would be a very high probability of serious, on-going conflict. The Zionists were not “western colonialists”. Stop talking shite. That’s a very long gasp! I suppose many of the current crop of American fanatics could be described as such ( Woodrow Wilson just shifted in his grave) but surely Eastern Colonialism is more accurate. Yesterday’s election results confirm that the Zionist colonial project is still very much on course. Perhaps we may even see further outbreaks of ethnic cleansing? What do you think Pretz?? Now, “Mick”, are you “Ariel”, “Nat” or “Hadara”? Very much the narrative of the extreme delusional left and their political allies, Islamists. Your excellent research will one day be used by those who will be questioning the BBC staff about their political outlook. They of course, will be claiming that they are a-political but a clear picture emerges from this well presented documentation. The problem is starting in ’45 at all. No mentioning of the Arab revolt, of the Arab terror attacks from 1920 onwards, of Arab pogroms. This is not distorting, it is faking. Orwell`s fiction turns into reality, sponsored by oil dollars. Very much the narrative of the extreme delusional left and their Islamist political allies. . Your excellent research will one day be used by those who will be questioning the Guardian in a public arena about their personal political outlook and how it impinges of their presentation of ‘facts’.. They of course, will be claiming that they are a-political but a clear picture emerges from this well presented documentation. Can the someone complain to the Teaching minister to review how come a leading paper is deviating from the national agenda and the historical facts? For a long time now UK Education Ministers have set a National Curriculum for History that helps Britain’s children to learn how to interpret ‘historical facts’ using evidence. A tall order when History only occupies about one and a half hours per week for 40 weeks in the school year. But, by all means write to him. I doubt that he’ll consider the Guardian a “leading paper” though. He’s an ex-journalist for the Times and Sunday Times. I’ve just seen this link to a story about a EFL textbook where Israel is completely erased from the map.